As it is in any artform, the first thing an artist is recognized for is very rarely the first thing they’ve “done.” A lot of game developers start off by publishing smaller flash games for free on sites like Newgrounds, and Edmund McMillen, the mastermind behind Super Meat Boy & The Binding of Isaac, is no exception. The Basement Collection gathers all of Edmund’s best freeware games from 2006-2009 into a packed collection stuffed with updated graphics, alternate soundtracks, commentary, easter eggs, and art. While this release will probably only be played by fans already familiar with Edmund – it’s an excellent compendium of work that showcases the talent of one of the best developers in gaming today. Seven games are featured here including the original flash prototype for Meat Boy. While the original Meat Boy features a lot of the core components that would define its later release like its heavy difficulty and enemy free platforming, the controls are clunky compared to the perfected ones of its sequel. Coming from someone who has beaten Super Meat Boy 100%, the relative simplicity in the level design of the original in comparison to its major release counterpart makes the game frustrating to play especially when dying over and over is caused more by bad controls than difficulty. Although Meat Boy is the most instantly recognizable game in the bunch, it’s also the flimsiest and, thankfully, the only game here that feels included for posterity’s sake. Time Fcuk, a trippy puzzle platformer about a guy facing his (literal) inner demon that with gravity shifting and dimensional hopping puzzles, and Spewer, a physics base platformer about a small worm whose vomit manipulates the world in different ways (it’s not as juvenile as it sounds), both showcase Edmund’s amazing talent for level design. 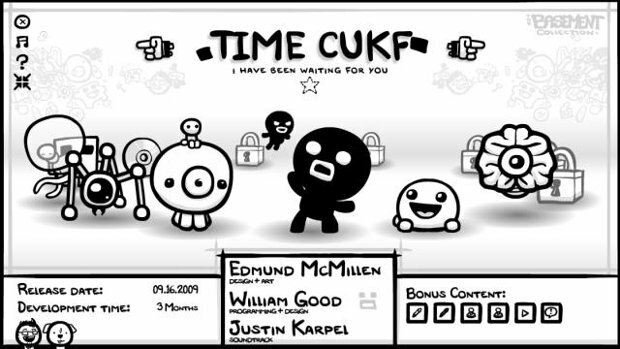 Although the thematic content of Time Fcuk is stronger than Spewer’s, both games are incredibly well thought out and could hold their own as standalone games. Coil and Aether, two other games in the collection, are the most artistically minded out of the bunch. While Coil is an interesting diversion that really stands out from the other games, its appeal rests largely on its unique approach. It’s an abstract, experimental meditation on death, but there’s not a whole lot to it. Aether, on the other hand, is definitely the biggest accomplishment here and the less said about it, the better. It explores the idea that deep rooted anxieties are never easily fixed, but challenging them will broaden your worldview more than you ever thought. It’s the most honest and personal game here, and it’s the game that gives me the most promise about Edmund’s potential. Triachnid and Grey Matter are the last two games that round out the collection, and they’re good but not amazing. Triachnid’s hinders purely on convoluted controls (which I guess is the point), and they’re such a struggle to use that it will make the game unplayable for a lot of people. Grey Matter is a standard arcade style “shooter” that is probably the most difficult entry in the collection, but there’s not a lot in it to differentiate it from other games like it. Regardless, The Basement Collection is an absolutely essential purchase if you’re a fan of Edmund’s other work. Yes, you can still play all of the games here for free on Newgrounds, but the extra goodies and the cheap price make it well worth purchasing. Although some of the extras do feel needlessly self-indulgent or come off as unfocused rambling (Edmund answers the same question about Coil in the Q&A section about five times), it’s good to know that The Basement Collection wasn’t a half-assed cash in. If you’ve seen him in the documentary Indie Game: The Movie or read an interview with him anywhere else, you’ll know Edmund McMillen is an extremely generous guy that gives to his fans as much as they give to him. For only $4, The Basement Collection is an absolute must have. Dude, get it.